This was my kitchen counter earlier and it was a sight for sore eyes, indeed. Is there anything more beautiful and colourful than this? Hues of pink, purple, yellow, orange – how bright and cheery for a January grey morning! I had been collecting an assortment of citrus on my little jaunts to the market and I realized that I had a pretty sweet collection: tangelos, clementines, blood oranges and a pink grapefruit. All of these citrus fruits are of the tart variety because the sour-er the better-er is how things are in my books. But if you have honey mandarines or tangerines, by all means, throw those in as well! And what better way to celebrate all of this citrus, but with a bright and colourful fruit salad. First things first: peeling. If you’ve never removed the skin of an orange with a knife, here’s one big helpful tip: use a sharp knife! It really helps and not just with cutting the peel off a fruit. One of my new year’s resolutions is to sharpen my knives more and since I’ve got a handy little sharpener , I can do it myself when the need arises – which should be about once every couple of weeks or so. Sharp knives makes cooking so much easier. And slicing the peel off the fruit is really quite simple. Cut off the dimple end and then just slice downwards, curving with the fruit, until all the pith (the bitter white stuff) and peel is gone. As for this fruit salad, it’s delicious. I wanted to bump up the citrus-ness of it and give this a wallop of flavour, so I used lime juice and marmalade in the dressing. To add texture, I also added in some unsweetened coconut (though if you’ve got sweetened, use that instead) and pecans, along with a little lime zest for colour. But the biggest surprise came from the greek yogurt, so please don’t skip this step. The yogurt makes this salad special and adds a creaminess that will make your mouth really, really happy. Slice off the top of the blood orange. Use a sharp knife to cut off the rind and white pith all the way to the bottom, being careful to not remove too much of the fruit. Repeat until the orange is clean of all peel. Repeat with all the fruit, remembering that clementines have a very thin peel while grapefruits have the thickest peel. Slice into wheels and remove any pits. Place in a bowl. Combine the lime juice and marmalade and whisk until liquid. Taste. Too sour? Add more marmalade or a bit of sugar and whisk again. Pour over fruit. Sprinkle with lime zest, coconut and toasted pecans and toss. Serve in individual bowls and top with a large spoonful of yogurt. Spoon leftover liquid over top yogurt. Makes 4 servings. mmmmmmmmmm this looks delicious — a perfect way to wake up my tastebuds in the morning. i’ve been making your winter fruit salad with grapefruit and apples lately — this one will be a nice change. thanks! There are days when I hate being citrus-intolerant. 🙁 But my husband will love this! Great salad for cold/flu (or any) season, and a good excuse to finally try out greek yogurt. I am loving all things citrus right now. Love this salad! OMG I’ve been craving citrus something fierce! I may just have to make this! Looks delish and so beautiful! I want to candy those peels! One woman’s peels are another’s candy? Isn’t that how it goes? Some wicked photos! Love to wake up and have that salad tomorrow. Oooh the elusive Pyrex Dots bowl! I’ve never seen one out “in the wild”. Sorry to keep focusing on the neat vintage kitchen stuff of yours, I honestly really love your recipes too! They look like jewels of goodness! This sounds so good right now, I’m going to have to go out and get more citrus tomorrow! I love citrus at this time of year and having that array of colors on my counter would make me unbelievably happy. All that color! This salad sounds delicious. I need to stock up on my citrus and when I do, I will surely be making it! So pretty! I’m loving citrus right at this time of the year. So colorful! It’s the prettiest salad I ever did see! Jeanette, what kind of Greek Yogurt do you use? I live in Vancouver, too – but don’t really know what to choose. This citrus extravaganza looks delicious. 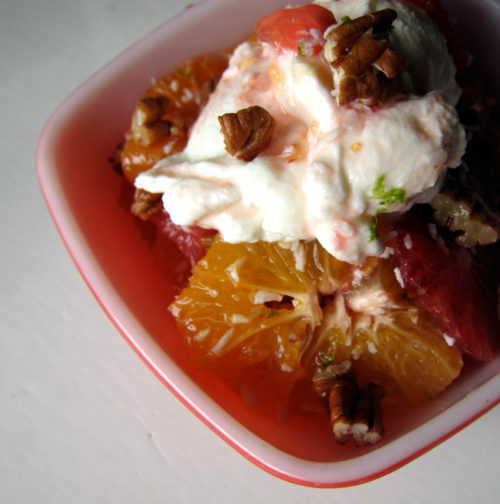 I agree, citrus and greek yogurt are a beautiful match. 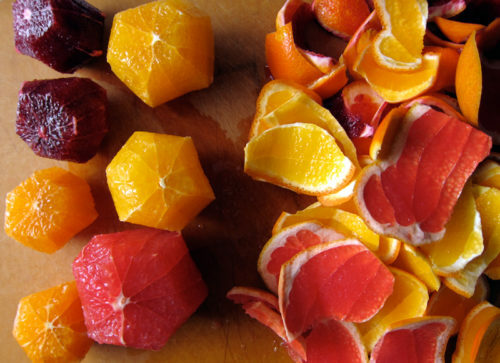 Fabulous assortment of citrus – and those blood oranges look amazing. 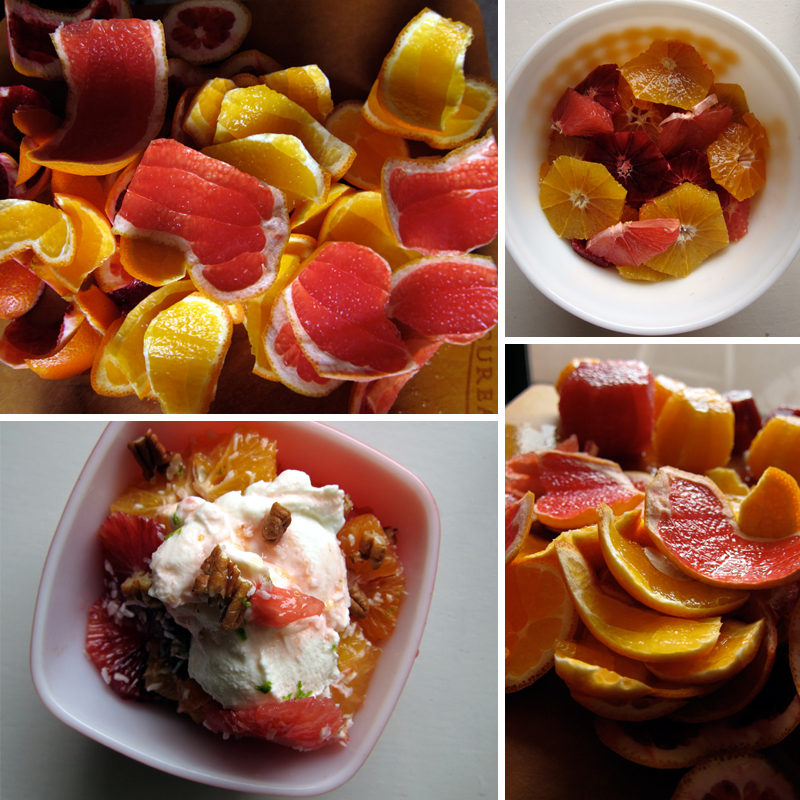 You could make an awesome assortment of candied citrus rind with the leftover peels. That salad is so, so, so pretty!!! Gorgeous!!! This is SO gorgeous. I love the combination of colors. I make it a point to eat at least two citrus fruits a day in the winter (to ward off colds!). I love oranges, grapefruits, and pomelos (have you ever had one? they are amazing) and I find I can eat them without ANY embellishment. But this salad looks wonderful, especially because I am SUCH a fan of pecans and yogurt. Thanks for a great inspiration. 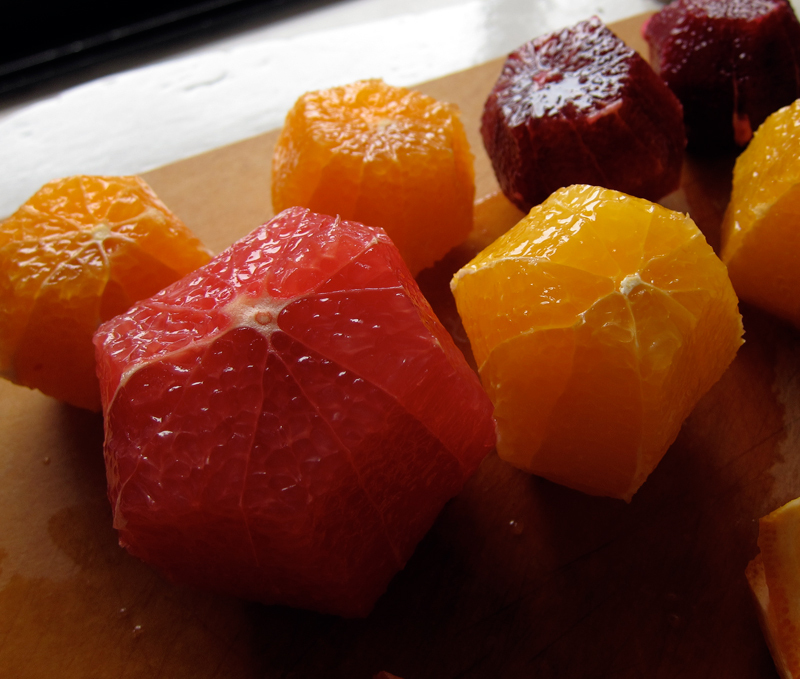 I find little as pretty as images of sectioned citrus. It’s a shame that I haven’t had a blood orange yet this season! wow – those look delicious! Thanks for all your lovely comments! Now I’m cursing myself that I didn’t use the peels to make candy…what was I thinking!! Foodelf, the stuff I’m currently using is Greek Gods greek yogurt – it’s really good. I’ve also really loved Krema’s low fat greek yogurt and Liberte’s 0% greek. All good choices readily available in Vancouver. Rivki, I’ve had a pomelo only once before and I loved it. I liked how dry it seemed but when I bit into it – a pop of juice and flavour! Thanks for the reminder. Simple and healthful and just perfect!!! This looks so bright and lovely! A perfect afternoon treat with tea. I think I am going to throw some clementines in mine..
I’ll give one thing to you — winter salads always need something like “Wallop” in the title… just to give them some oomph. This reminds me of an updated version of the old fashioned fruit salads my grandmother used to make. Lovely. Comforting. And tasty. Maggie, I put clementines in mine and it was perfect! Ha, I agree, lo! Always the wallop! This looks so beautiful,Jeannette. I’m catching up on my blog reading and you have been cooking so much good food. I hope 2011 is treating you well! This will be breakfast tomorrow morning. I can’t wait. like gorgeous jewels there are….i keep telling my husband we need to get an morro orange tree…yummy! Aw thanks so much for stopping by Tim! Have I told you how much I love the L+D tote? It’s seriously the best thing ever. Ever! Hmm, now I’m curious about what a morro orange is! Thanks Shellie! What do you do with all the peels? Steve, if you want you can candy them or zest them all beforehand & let them dry for use in flavoured sugars or salts or seasonings for cooking. I’m sure google would also have a ton more ideas.